Germany Leads and Italy Lags on EMU Inflation! 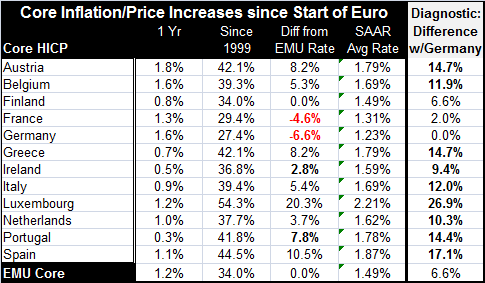 Belgium, Luxembourg, France, and Germany lead the EMU internal inflation parade (in that order). Pulling up the rear are Portugal, Ireland, Italy, and Finland (in that order). The euro area does show some Keynesian tendencies as areas with low unemployment rates tend to have faster inflation. However, in all case, the headline inflation rate is higher than the respective nation’s core rate. And this has to do with ongoing pressure from oil prices. In evaluating the policy risks, the ECB has continued to emphasize core inflation when the core is much lower than the headline and when the headline pressure can be clearly traced to high and rising energy prices. Those conditions continue to apply. Since 2013, German core inflation has been higher consistently than EMU core inflation. This is a turn-about. Since the EMU formation, Germany has run a lower inflation rate in its core and headline rates persistently than any other members. Since the EMU formation, the German core rate has risen by 27% compared to a 34% rise for all of the EMU. The German headline price level has risen by nearly 35% while in the EMU the price level has risen by nearly 41%. Germany has amassed a great deal of price competitiveness by running lower inflation rates than the countries it shares a currency with. But since 2013, that has gone into reverse to some extent. During the period since 2013, Germany has continued to run a much lower rate of unemployment than the EMU and than other EMU members (Remember that when I cite German vs. EMU figures the German figures themselves carry a heavy weight and are already an embedded part of the EMU number). The gap between the German rate of unemployment and the rate for the whole of the EMU was at its widest in mid-2013. But it is impossible to just compare unemployment rate differences as a mode of analysis. Before the global recession, German unemployment rates were higher than of the euro area on average and the Germans subsequently adopted Hartz labor market reforms conduced in the early 2000s that helped it to become more efficient especially in the wake of German reunification. The point remains, however, that Germany has a post reunification low in its unemployment rate while the rest of the euro area largely does not fare as well. Greece, Austria, and Luxembourg still have unemployment rates above their median rate measures since 1991. France and Italy still have unemployment rates barely below their medians for that same period. With a tighter labor market, Germany has decided its time for it to work on its fiscal issues and it has been dampening domestic demand by running a fiscal surplus and reducing the stock of its long-term debt. This does not help the rest of the EMU that is struggling to create demand and is unable to use fiscal policy to achieve that. In fact, Italy is specifically looking for an expectation from the Maastricht rules to enable fiscal stimulus because of its long period of consolidation in the wake of the financial crisis, a period during which Italy has played by the rules. But now, a decade after the financial crisis, Italy’s GDP is still below its pre-crisis peak. Italy has not been able to effectively grow GDP in a decade. But the EU Commission stands in its way – it has allowed no exception/no exemption. Needless to say, in this environment it is Germany that stands alone with problems and issues that are 180 degrees different from its fellow EMU members. Clearly, the euro area has some policies it needs to reconsider. Germany has done well under Europe rules, rules it largely set in place when the single currency area was formed. And Germans understood these rules and their consequences better than most members and so it has done better under these rules of the game than have fellow EMU members. Many of them did not understand the constraints of the new monetary system and have gone off track only to suffer extremely painful consequences. Italy is in that situation. Greece went through its own baptism of fire. Spain and Portugal have gone through austerity procedures. Under these Germanic rules, the euro area has gotten inflation back under control in the wake of the financial crisis. We could give it plaudits for that and praise the system, except that the U.S., a country that has pursued fiscal stimulus during the same period and was an early leader in implementing conditions of generous monetary ease, also has emerged with solid growth, better than in most of Europe, and low inflation to boot. 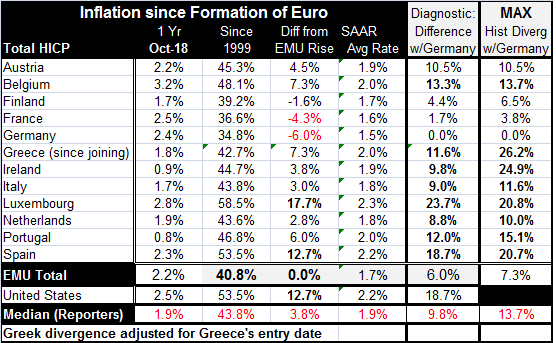 Viewed in this way, I think the euro area looks a great deal less successful and the strict enforcement of EMU rules (Maastricht criteria) appears to have put undue hardships on member states. The acid test for policy is not simply a check on how an economy is performing. Nor is it a measuring up of performance by one metric like inflation. It is also about how we got here what price we paid to get here and what other forces are in play. Global economic competition has been keeping a lid on prices. Bank regulation is constraining banks from a wild reaction to low rates with excessive loan growth. And we find inflation has been hard to start. This past week Fed Chair Jerome Powell said that wages still haven’t increased as much as he had hoped. And that is a shocking statement from a sitting Fed Chair, admitting that he was ‘hoping’ for higher wage gains. The world has changed. Its risks have changed. And in some ways, the economic frameworks we have assembled from the global trading system to the EMU are in a mess. They greatly need to be rationalized in view of the economic models that were used as an excuse to construct them. The EMU is a caricature of an optimal currency area. The World Trade system, its rules and the behavior of trade participants are very bad caricatures of Free Trade. When are the adults going to show up and begin to make the needed changes? Make no mistake about this: THIS is NOT a sustainable system. It is a system with winners and losers and as ever when you try to change it winners become whiners. Change is long overdue.